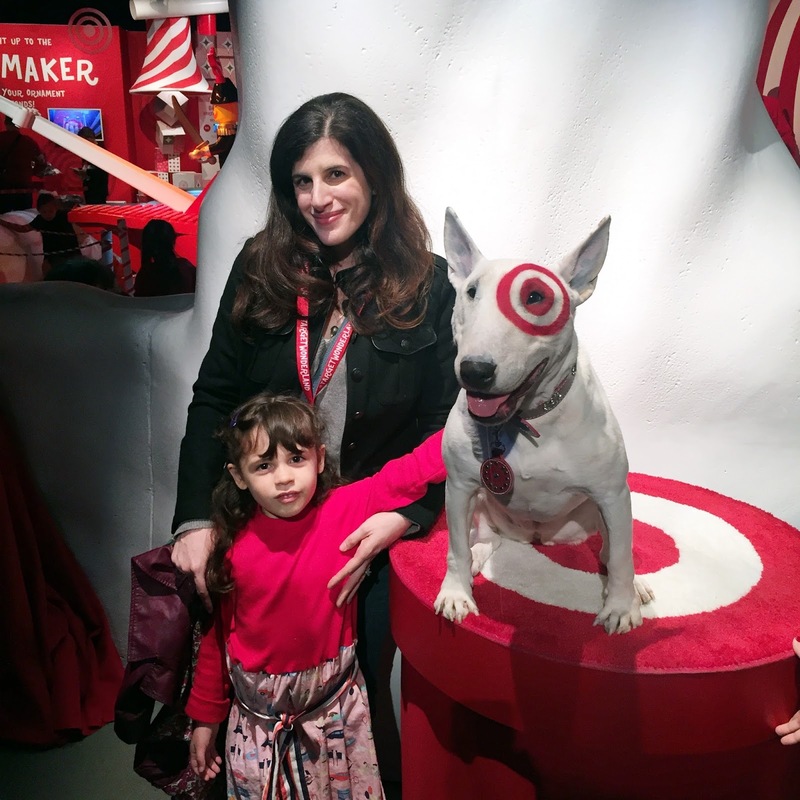 Me, my daughter, and Bullseye (apparently that's the name of the Target dog. Who knew?). This week, man. This freaking week. Let's just say, it was busy and strange and just...weird, but now it's over. Good riddance. There were many high points though! We took the kids to see the Radio City Music Hall Christmas Spectacular (lesson learned: a 2.5 year old boy is NOT READY FOR IT), we took them to see Santa (no tears from either one! ), and on Monday, S and I went on a mommy/daughter date to a preview of the new holiday popup in NYC, Target Wonderland. Going on through December 22nd and free to the public, Wonderland is a sort of Willy Wonka-esque toy-store-meets-playground. There are photo-op stations, a ginormous ball pit, and plenty of opportunities to buy toys along the way. It was fun to get a sneak peek. But the best part? The celeb sightings! We saw Neil Patrick Harris, Chrissy Teigen, Malin Ackerman, and Kristen Bell. Funniest moment of the night was when the Target people tried to orchestrate a photo of Kristen Bell flanked by a few little girls. My daughter was one of them. Cool, right? Not according to her. Target, and even KB herself, tried multiple times to get S to pose, but she was not having it. I tried to explain to her that it was Anna from Frozen, but that wasn't registering. S was busy getting a glitter tattoo and no A-list actress was going to mess with that. (You can see a funny picture of the incident here on my Instagram.) There was one celeb she was excited about meeting though: the Target dog. Yep. Anyway, I hope your weekend is fun, relaxing, and wonderful. Here's a few fun links to check out when you have a moment. Enjoy! • #BagGoals: Saw this beautiful hobo bag in person in the store earlier this week and fell in love. • I love everything about this look: The braid is killer and the hair color is insanely amazing. • What happens when you live like a Victoria's Secret model for a week? My friend Carly, an editor at Cosmo, did just that. • Loved this tour of fashion designer Kim Bachman's beautiful home. • Gifts for women who love food. • If you haven't yet seen the Instagram Husband video, you need to see it. So true, so funny. •Loved every word of MJ's open letter to momtrepreneurs or, really, any woman with a side hustle. Such a good read. • Fascinating: how smiling has changed throughout the years. • Julianne Moore acted for tips in Times Square and it was so good. • Revealed what's on MY holiday wish list this year. • Named the 9 hottest holiday toys. • Shared some cool gifts for book lovers. • Gave a peek at our 2015 holiday cards. • Filmed my son with (chocolate) lipstick smeared all over his face. Well, I love Kristen Bell, but I also love the Target dog, so it would be a hard choice for me too.